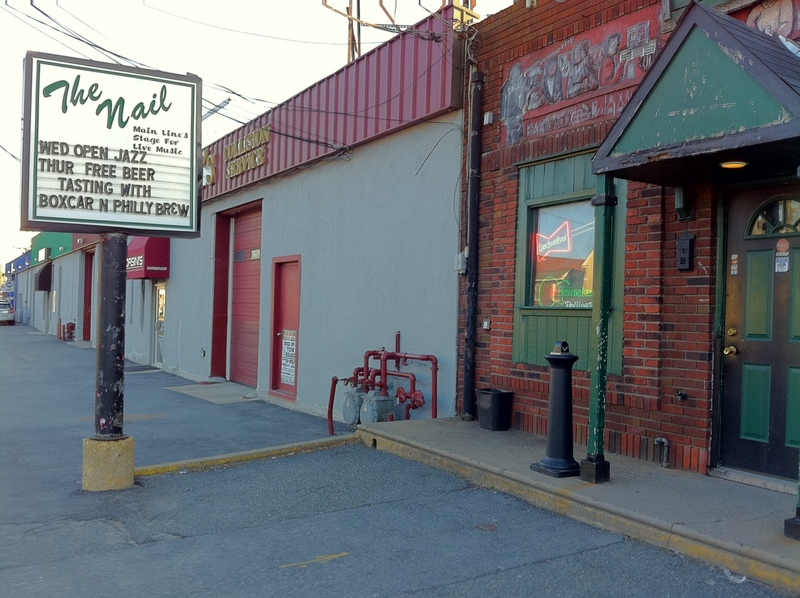 It wasn’t really that long ago that the three taps at the Nail in Ardmore on Haverford Avenue were Bud, Miller Lite and Bass (and the Bass ran really foamy). The bottles selection was pretty uninspired, with Yuengling and Coors Light to add to the familiar bar basics. After Chris took over the place, the bar got brighter (but not too bright) and the bottle selection became a lot more interesting. A couple of years ago I walked in and – lo and behold – there was Dogfish, Yards and Flying Fish, and any number of surprise craft favorites. When I eventually talked to Chris about promoting craft beer at the Nail, he was interested so we finally put together the first Craft Beer Night at the Nail on April 21st. It was my pleasure to join up with John who reps for Philadelphia Brewing and Jason part owner and brewer at Boxcar of West Chester – a new brewery that is getting some attention around here. With a helping hand from Fulton Bev, we were able to bring Boxcar’s “Original Ale” and “Brown Ale” along with Philadelphia’s Pennsylvania Pale Ale (mmm Amarillo!) 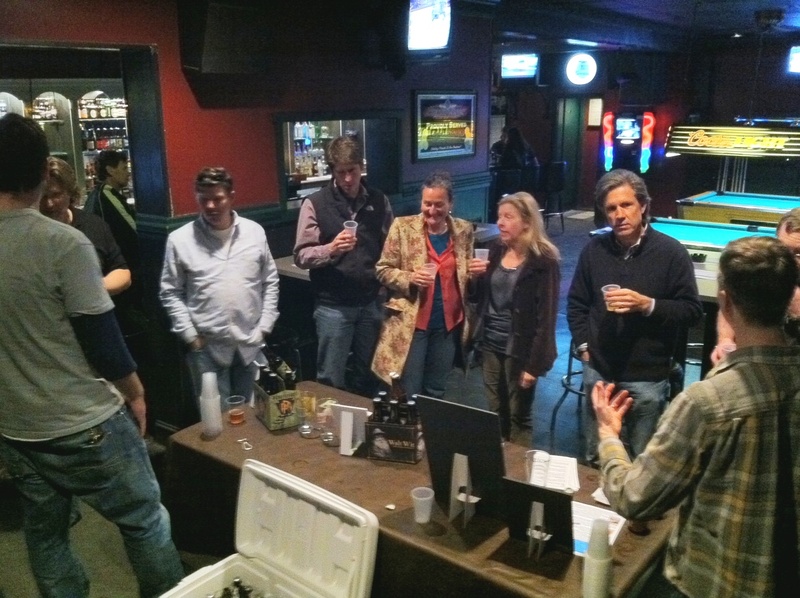 and Walt Wit to the masses at the Rusty Nail with a free tasting. John was rightfully proud of his hoppy new pale ale, and entertained beer appreciators with tales of coriander and orange peel when describing the Belgi-Philly Walt Wit. Jason was cornered by home brewers and beer fans a like – curious about his new brewery and what it was like to live the dream of being a “home brewer with a 300 gallon batch”. He told me that he had worked in California wine country before settling down due to family ties in this area – and how he copped his practice of “volunteer bottling” from the crazy folks at Lagunitas in Petaluma. Unlike Lagunitas’ strong brews, Jason’s “straightforward session beers” are designed for quaffing a few without suffering beer fatigue. A good time was had by all – and with great local beers including Phila Brewing and new offerings from Boxcar, it’s Philly Beer Week all year for beer appreciators in this area. Look for future craft beer nights at the Nail. Thanks to Jason and John – and Chris, Bill and the others at the Nail and all Beer Appreciators that made it out! Yes, you can now get great Live Music and Craft Beer at the Nail!